A zirconium crown is an advanced type of crown, that consists of a core made of zirconium oxide- a natural compound of zirconium that occurs in nature. On top of the zirconium core, a porcelain veneer is applied in the desired shape and colour of the restored tooth. Is zirconia a safe material? Zirconia is a 100% biocompatible material, that does not cause any allergic reactions. It has been used for more than 15 years in dental applications, with excellent results. Nowadays, it is widely used in orthopedic surgery for knee and hip prostheses and as an ear prosthesis. 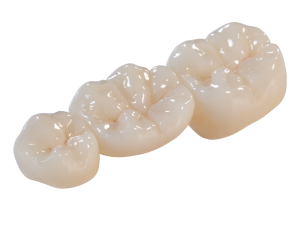 What are the advantages of a zirconium bridge or crown? 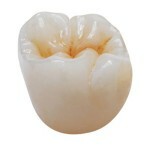 Zirconium crowns and bridges offer highly esthetic results. Thanks to their transulecence, zirconia crowns allow the light to pass through, as it is the case with natural teeth. In the case of traditional porcelain-fused-to-metal crowns, the metal frame blocks the light, preventing it from reflecting and retracting thus making the appearance of the crowns less natural. With zirconium crowns there are no dark lines at the gingival end, when a person smiles. As time goes by and the shape of the gums change, the collar of the porcelain-fused-to-metal crowns becomes visible forming a dark line between the gums and the crown. Zirconium crowns are very durable, yet less flexible than the traditional porcelain- fused-to-metal restorations. Hypersensitivity to cold or hot is avoided, because zirconia crowns are very resistant to high temperatures. They don’t cause any allergic reactions. Is a zirconium bridge right for me? Zirconium bridges are recommended for all teeth, both in the front and in the back of the mouth. They are most commonly used for teeth that show when you smile, due to budget constraints. As it is always the case, your dentist will advise you properly after an initial consultation. Can a zirconium crown be placed over dental implants? Of course, there is no restriction. For those wishing a perfect cosmetic result, we recommend to place zirconia crowns over zirconium implants. Zirconium implants are 100% white, thus the tooth restoration -crown and implant- reflects the light exactly like natural teeth.